In the galleries, the icon appears with the wall label. 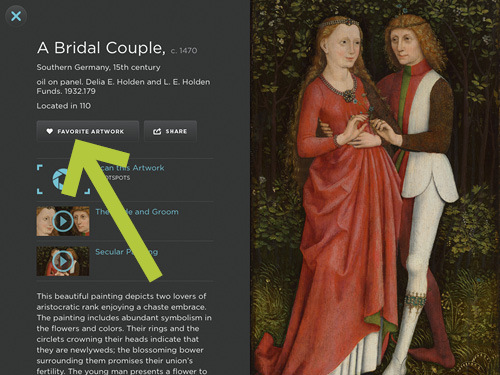 In the app, the icon is light blue, and appears in the upper left corner of artwork images in Near You Now, and below the favorites button on artwork detail pages. Stand directly in front of the art. Tap the scan logo. This is found both in the bottom right hand corner of the screen and on the artwork detail pages for scannable artwork. When the camera aperture appears/opens, hold your iPad up vertically in front of the artwork you wish to scan. 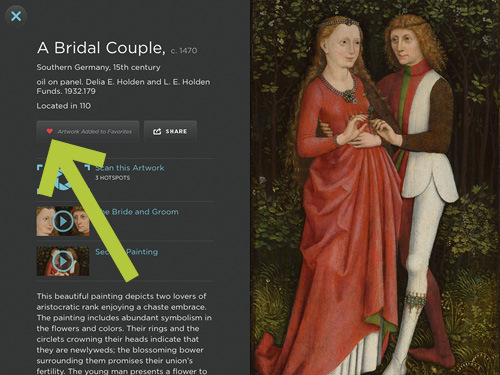 Content will appear linked to specific features of the artwork. Lower your iPad to a comfortable position, and learn more about the artwork. 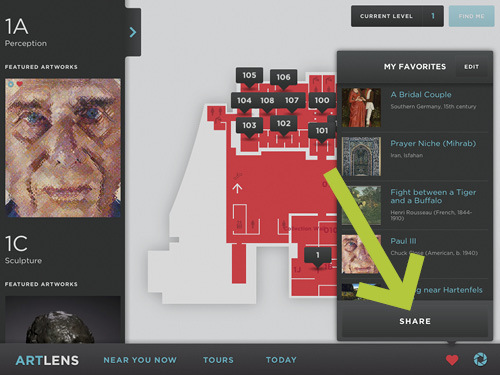 To create a tour, tap on the "Share" button at the bottom of your list of favorites. Select "Create a Tour" from the list that appears. Gray boxes will appear to the left of each of your favorited artworks. 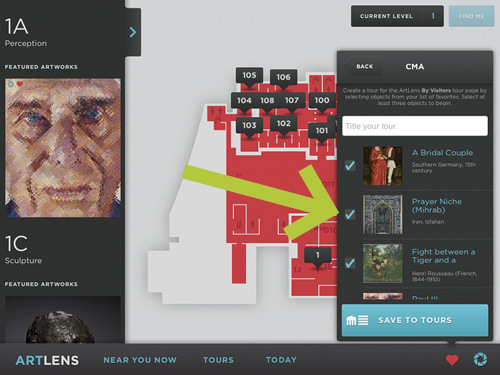 Tap the boxes to select the objects you want to include on your tour. Add a title for your tour in the box at the top. Now tap "Save to Tours." Success! 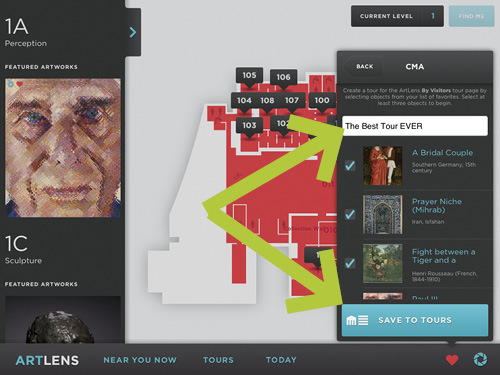 Your tour has now been saved to ArtLens. 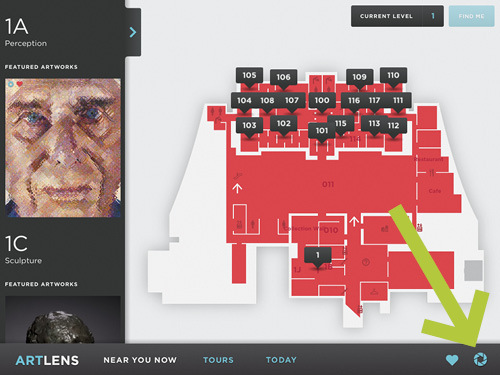 Please note that visitors' tours are uploaded to ArtLens once a week, so it may take up to seven days before you see it in the By Visitors section. Once it has been uploaded you can favorite your tour to make it easy to find again. There is no sound associated with the videos in ArtLens Gallery. 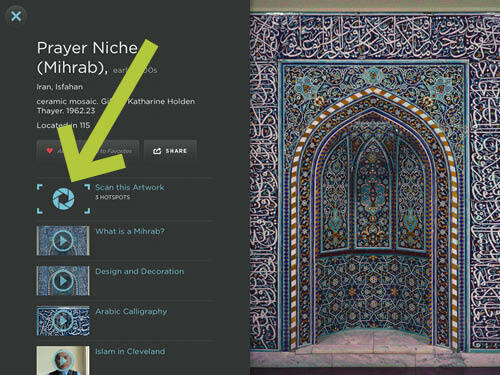 Videos associated with objects in other galleries have narration. We encourage you to bring headphones. The museum has 65 iPads available for rental at the desk located inside ArtLens Gallery, near the ArtLens Wall. The rental fee is $5 per iPad. We will hold your valid driver's license or student ID until return. The iPad is not required to experience many aspects of ArtLens Gallery.